Considered a cheap pinkish-red glass, cranberry glass was first developed in Britain during the late 19th and early 20th centuries. However, cranberry glass (or Gold Ruby glass as it is known in Europe) is a very pretty red glass made by adding gold chloride to the molten glass. It became very popular in Britain and in the USA, being used for drinking glasses and later for bowls and vases with trailed or enamel decoration. The main production period stretched from 1870 to 1930, when it was produced in England, France, Belgium, Bohemia and America. The American glassworks producing cranberry were mostly in New England, which happens to be where cranberries are grown, and so the term Cranberry was coined. 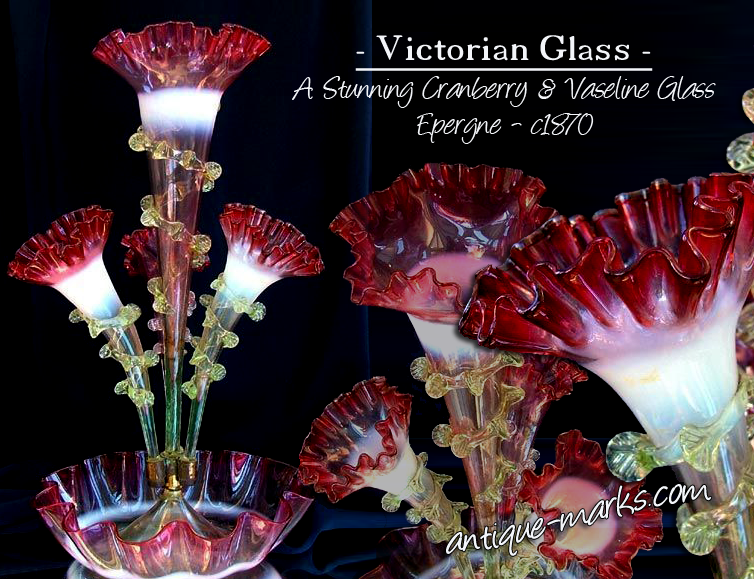 Collectible examples of Cranberry Glass, of which the Floriform Epergne pictured is one, should only be acquired if they are free of damage. 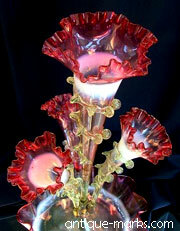 Antique cranberry glass will add value to your glass collection if you focus your collecting efforts on quality pieces.